The luxus of velvet with a thick and soft sole. The ultimate welcoming hotel slipper. 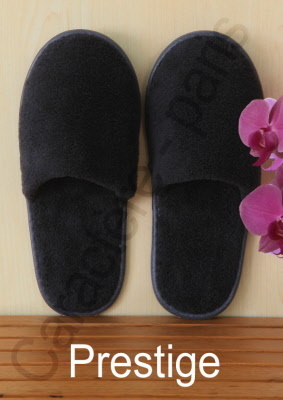 The Prestige hotel slipper is the most prestigious product in our assortment. This real slipper for luxury hotels has a long velvet lining. Its base is made of 3mm EVA that brings a softness and a feeling of wellbeing to the feet of your customers. The feet are caressed and they walk on a cloud. The black color of the velvet and the black edging are very current. This shoe is designed for our most demanding customers. Available in three sizes (choose) 2-5, 5-8, 8-11 and it fits to 90% of customers. This shoe is available in small amounts (from 10 pieces) and benefits from the reduction of the usual amount that we propose to -10% to -20% depending on the quantities. You can try and recommend taking advantage of the best discount.